Tablo is one of several DVR boxes aiming to squeeze more value out of over-the-air TV, but the latest version tries to stand out with a built-in antenna. Like the original Tablo, the Tablo Metro doesn't plug directly into your television. Instead, it hooks up to your home Wi-Fi router and acts as a broadcast TV middleman, recording basic channels like CBS and Fox and beaming the video to phones, tablets and set-top boxes. But while the original Tablo required users to hook up their own antennas, the Tablo Metro has a tiny, omnidirectional antenna built right into the box. The DVR can stream or record up to two shows at a time, even if the broadcast towers are in opposite directions. Nuvyyo, the makers of Tablo, claim that the antenna can receive signals from broadcast towers up to 25 miles away. So far, Tablo has apps for iPad, Android tablets, and Kindle Fire tablets, along with Web access on smartphones and PCs. But Nuvyyo says it's working on a redesigned public Roku channel (the current version is a private channel) and apps for Amazon Fire TV and Android TV. These additions should make Tablo much more practical for users who want to watch recorded broadcast in the living room. The Tablo Metro will launch early this year for $250, but it still has some added costs despite the built-in antenna; there's no mention of built-in storage space, so like the original Tablo you'll likely need to supply your own external hard drive. Also, certain features such as series-based DVR scheduling, out-of-home streaming, and channel guide filtering require a $5 per month subscription. Still, it could be an intriguing option for cord-cutters who want more flexibility from broadcast TV. The story behind the story: In a way, Tablo is trying to fill a void left by Aereo, whose method of streaming broadcasts from a remote antenna warehouse was deemed illegal by the U.S. Supreme Court last year. 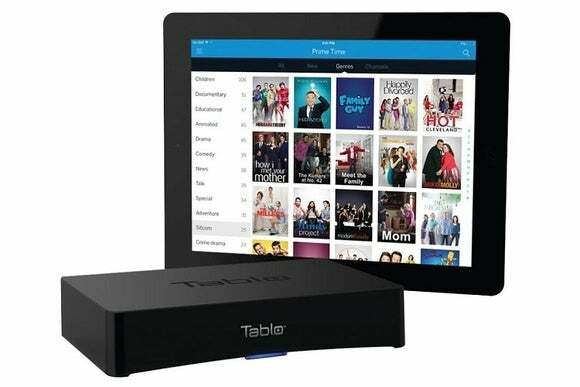 Tablo is essentially a create-your-own alternative, with the antenna, storage and DVR box living under your roof. It's legal, but it's also more complicated—and that's exactly the problem Nuvyyo is attempting to solve with the built-in antenna.